13: Annual Open House Event (11 - 1PM): Come visit, play, get your child’s car seat safety checked, investigate a real fire engine and more! Students enjoy curriculum enrichment activities such as Green Briar Nature Center, MA Audubon, Science, music with Tones in Motion, our local, annual fire and police department visits, social events throughout the year etc.. (included with tuition). Visit soon to see our children playing, having fun and witness something more subtle…learning. Thank you for your interest in our locally owned school. 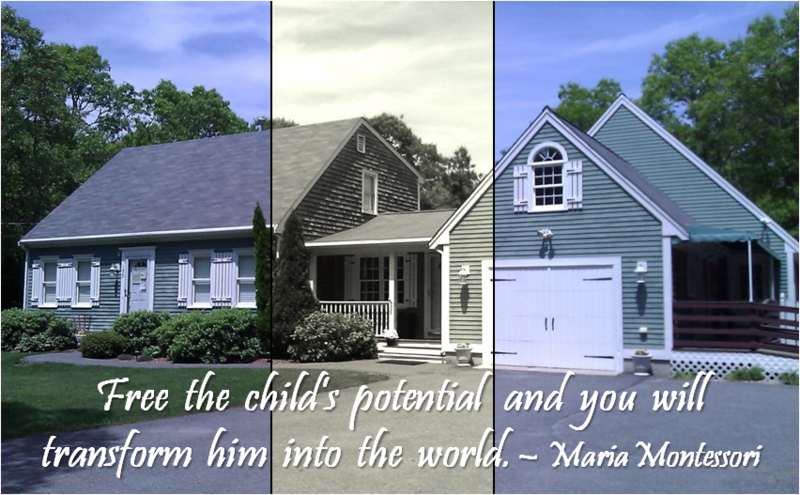 Since opening in 2004 with our first Infant/Toddler group, then adding our Pre School/Kindergarten in 2008, we have loved sharing Dr. Maria Montessori's amazing, relevant, child centered philosophy with families for 15 years! Our children are welcomed by a supportive, nurturing team of professionals, in a warm and mutually respectful learning environment! Our specially prepared environment, beautiful, large nature based play space and loving, nurturing faculty help foster growth and self esteem in your child. We invite you to come see for yourself what an invigorating, supportive and unique community we have! Students are supported, mind, body and spirit and develop knowledge from the concrete to abstract, using hands-on learning. Each month brings new concepts, challenges and materials to explore (click 'NEWSLETTER' under MBS COMMUNITY at the top of the page to read more). Hands on Learning which builds focus, makes vital hand to brain connections and engages active learning. Skills build and transfer from one area to another. Grace and Courtesy (social skills) develops concentration, builds respect and community. Provides opportunity to negotiate and resolve conflict. Also, creates safety in the classroom (when children feel safe they are able to learn). Practical Life (care of self - care of others - care of environment) is purposeful, develops motor control, coordination, develops independence, concentration, and a sense of responsibility. Multi Sensory (5 Senses) Approach provides many opportunities from a young age to experience curriculum from learning about numbers to learning to speak, write, read or experience music and culture. Different learning styles are nurtured indoors and outdoors through real world experiences. Under direction of specifically prepared teachers (Montessori trained and state certified), children experience the joy of learning and time to enjoy the process of discovery, helping foster their growth and independence. By providing opportunity for your child to become independent, you further enhance their self esteem, which is in direct partnership with us. When you visit, you will see materials and environments Maria Montessori designed over one hundred years ago, that are still relevant today. They support every aspect of the current STEAM (science, technology, engineering, art and math) curriculum. Physical Development and gross motor exploration is supported by year round, outside play everyday, weather permitting. In 2014 we were designated the first school on Cape Cod with a certified, nature based, Nature Explore play space. (click the word Nature Explore above to learn more). Based on Heritage Garden's Hidden Hollow; our large, ever changing and fun outdoor classroom/play space connects children with the wonders and beauty of nature.